Hot Bath an' a Stiff Drink opened the 2014 International Family Film Festival on November 7 in Los Angeles. In recent times, the traditional western has seemed to become a thing of the past with so many film makers choosing to these films with other genres. Hot Bath an’ a Stiff Drink is the start of the film trilogy which will fulfil those who have been missing the true western. Incredibly atmospheric and wildly intriguing, the first film in this trilogy captures the heart of the wild west and is thoroughly enjoyable and delightfully unpredictable. Hot Bath an’ a Stiff Drink is the perfect old-fashioned western. Arizona 1863: A happy family gathering turns into a terrifying bloody massacre when a group of outlaws storm this occasion, leaving none alive but the children alive. 10 year old twins, Vance and Tom Dillinger are separated when the outlaws kidnap Tom and leave Vance at the scene. Thirty years later, Vance (Jeffery Patterson) is a U.S. marshal, while Tom, now known as Lucky (also played by Patterson) is a wanted man. However different their lives may be, Vance and Tom are still the spitting image of each other and this leads to a case of mistaken identity where a witness believes Vance was the one responsible for a coach hold up. When the brothers meet face to face, they have a chance that they can finally have their revenge on the man responsible for their family’s deaths. The first instalment of Hot Bath an’ a Stiff Drink gives the impression of exciting things to come for the trilogy. 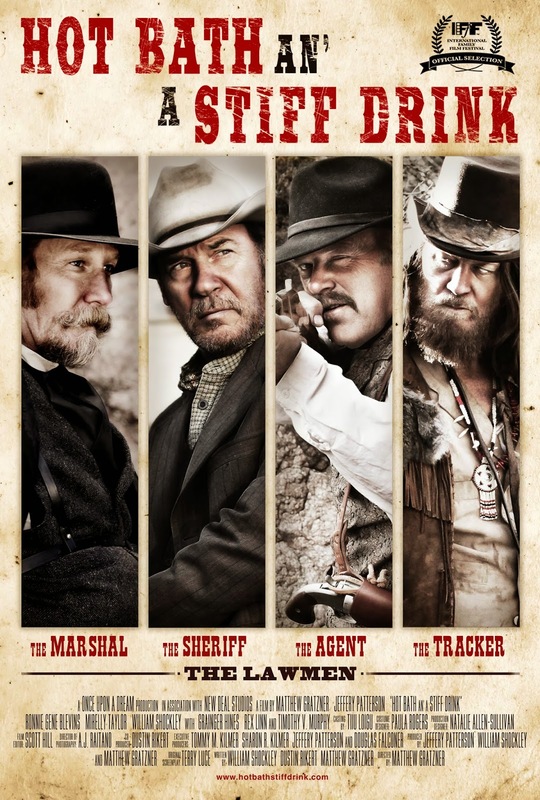 While it will be an obvious delight to any westerns fan, it appeals to a greater audience with its themes and is original, explosive and entertaining. At the heart of the film lies the theme of family and the idea that blood runs thicker than water. A lifetime may have passed between Vance and Tom, but they are still brothers and their loyalties lie with each other, despite not having known whether the other was alive until moments before. It is a revenge story for Tom driven by the love he had for his family. Vance experiences the same love, but the differences in his upbringing have allowed him to cope with his grief without resorting to revenge. From the very first scene, Hot Bath an’ a Stiff Drink is action-packed and pleasingly tense. The film begins with a bang and demands its audience’s attention straight away with its intensity. It is in this very first scene that it also becomes evident just how reminiscent of the classic westerns directed by the likes of John Ford that this film is really going to be. Set in the 1800’s in Arizona, the film visually creates the feeling of actually being there with the characters and experiencing everything that they are from a sensory aspect. It is a thrill to see in the film the old saloon and other things typically found in a western film such as gun fights, stagecoaches and trusted horses. While moving and suspenseful, it does not lose its enjoyment and element of fun. Jeffery Patterson has the wonderful, but challenging duty of playing the two main characters of the film and does an outstanding job. He gives both Vance and Tom completely different attributes both physical and emotionally. In what must be quite a complicated task to achieve, Patterson does extremely well and the audience in completely intrigued by both Vance and Tom Dillinger. Another great things about Hot Bath an’ a Stiff Drink, is that despite having a fairly male orientated cast, there is not an absence of a strong female character. Mirelly Taylor plays Sence Soto, who is one of Tom’s band out outlaws and she is a great character who can match any of the men with her sharp shooting and courage. She is a modern character in a traditional piece, but a welcomed one. Hot Bath an’ a Stiff Drink is an incredible start to what promises to be an enjoyable trilogy. It is a reminder that family is always family, no matter who you turn out to be and that is where your loyalty will always lie.